If you haven't heard, they're remaking "Robocop", the classic Eighties movie about a policeman cyborg with pouty lips and a literal chrome dome. Why, except for the robot parts and the penchant for violence, they could be talking about me! Now, Data's not inherently a warrior, but he can hold his own, while Robocop's not exactly an intellectual. I'm not saying he's dumb or anything, but they just hustled him out of Home Depot for hitting on a toaster oven. We'll set aside the technological advantage Data would have from his century with the phasers and the transporters. We'll give them both Robocop-era weaponry, then set them down in the rocky desert, all Gorn-style. Who would win? I think you forgot the poll. I gotta give the edge to Murphy here. They’re both using 21st century weapons which means bullets. Robocop is pretty much bullet proof. Data, not so much. I’m not saying that Data would go down in one shot, but if enough bits of circuitry got shot away, eventually he’d experience a “fatal system error”. Robocop’s armor gives him a significant advantage in a straight on firefight. Data is the more creative one though. If he had time to prepare (isn’t that ALWAYS the caveat? ), he might be able to set some sort of fatal trap. Or he might fashion a rudimentary cannon out of bamboo, sulfur, charcoal, etc. Except the Mybusters already busted that one. Given the parameters set, I gotta say Winner: Robocop. I’ve got to give it to Data, Data is more Adaptive! Robo looses his gun and he can’t really go all hand to hand. And I think data might be able to use Robo’s programming against him! I’m going with Data on this one, for brains, speed, strength and adaptability. Though I do think he can take a fair amount of damage before he starts having issues – I’d think he could get close enough, fast enough to tear something important off of Murphy. Lol, and if he had some time, he could just put his cat Spot up in a tree, and call it in – Murphy would show up to rescue the cat, then BAM! Data’d in the head with something heavy. Data wins every day of the week and twice on Sunday. Robocop uses guns. Data is bullet proof. Watch Star Trek: First Contact. Data is stronger and faster than Robocop and he carries a directed energy weapon. Data would probably win this, based on his two advantages: speed and knowledge. In terms of strength, accuracy, and damage resistance, they’re probably comparable, but Data has been shown to be able to perform tasks at superhuman speeds when needed, and his positronic processor handles a much more varied and thorough knowledge database than Robocop’s much more conventional ICP silicone chip-based computer with police database attached to Murphy’s brain (a cop that didn’t have the foresight to avoid the ambush that left him for dead, necessitating the need to cybernetically rebuild him to keep him alive). Give each of them one of those guns that Boddicker and his goons had that act like mini-bazookas (but in reality are Barrett M-82 anti-material sniper rifles), put them into some open range combat arena, and I’d say Data takes it 7 times out of 10. They’re both somewhat bulletproof, but neither is proof against a large enough caliber. Normally, I’m all for speed and agility over power, but from the episodes Ive seen, it doesn’t really take that many hits to take Data down. Murphy, on the other hand, is all about the dogged determination and can keep going after a truly appalling amount of abuse. Neither miss, so they both take damage, but Murphy stays standing up longer and takes the Pyrrhic victory. Data, easily. You see area right underneath Robocop’s visor? Kinda fleshy colored? Data can hit that easily and it won’t take but one or two shots to put down Robocop permanently. Point out a similarly vulnerable point on Data. You can’t, can you? As already pointed out Data is bulletproof, up to and including at the very least submachinegun fire (ST:FC). Further, based on informed abilities Data is known to be able to move faster than the human eye (TNG: The Offspring) and unerringly accurate with firearms (TNG: A Fistful of Datas). If they are actually set upon killing each other, Robocop wouldn’t have a prayer. Just because Data can stand up to a short hail of bullets doesn’t mean he can ignore the laws of physics. Eventually those bullets are going to wear him down. Assuming Robocop doesn’t just shoot out both of Data’s eyes in a microsecond. Kinda hard to aim a phaser (even if Data had a phaser, which he wouldn’t in this contest) when you have no eyes. And even then, TNG phasers are the most laughably ridiculous weapons in the history of science fiction. It’s a miracle Starfleet officers don’t blow their own feet off pulling them out of their holsters, let alone hit anything with them. Robocop has high-precision targeting software and a weapon that’s actually feasible for combat. TNG phasers are apparently designed to be passed off as electric shavers for covert agents. I tentatively voted for Data. My memory of Robocop is scetchy (sp?) at best. To me, Data is more memorable. Anys, I voted for Data for the one thing that He doesn’t have that Robocop has, which is emotions…if he didn’t use the emotion chip. Seeing all of his techs was taken out of this vs. then his emotion chip would not count either. He has unerring logic and can process faster than Robocop can. Because of that processing speed, he would be able to determine just a bit faster than Robocop on how to defeat him and use those few seconds to take out Robocop. I would almost call Data an “update” of Robocop, almost. So, that’s my reasons. Might not be as logical as others…LOL! mm. Both have shown a surprising invulnerability to projectile weaponry. 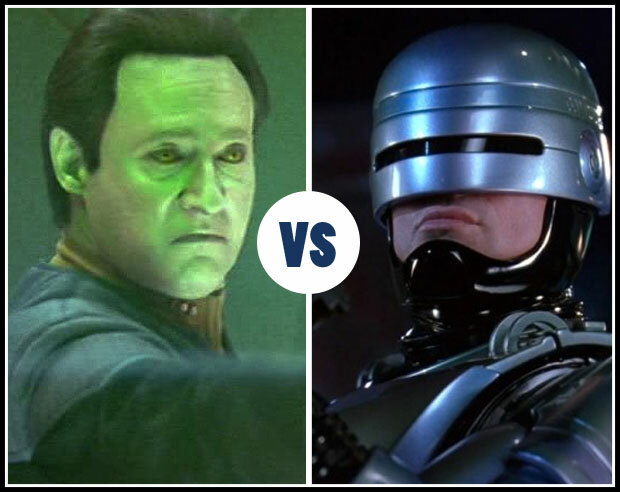 Comparing Data’s unusual strength and speed to Robocop’s stamina might make things close. BUT. Jeff said drop them in the rocky desert. 1. In all likelihood, Data’s reaction time and adaptability mean that they run out of ammo / charge before finishing the job. 2. Data fades back between rounds with intelligent foresight to practice throwing. 3. Data uses rocks, thrown at roughly 3 times human strength and with near perfect accuracy and timing, analyzing Robocop’s patterns, including throwing one for him to block and one to get past the block. 4. After 759 hits, Robocop’s damage is too great to fight. 5. Data buries him up to the head in sand for the head start. 6. Data uploads Robocop’s memories. 7. Data programs Robocop to help him capture whoever dropped them in the rocky desert, overriding all former programming. 8. So Robocop loses, followed by us, because we put them there. AAAAnd once again, the reign of the silent voters rears its ugly head. With even more of a discrepancy this time. votes with comments: 9 to 3 or 75% in favor of Data. Actual votes at this time 55.6% in favor of Robocop. RoboCop may have defeated a Terminator or two, but Data has superior technology and reflexes. Data would end up shutting down Murphy’s chassis and they could wax existential until a third party shows up. Um–yikes. The wife pointed out something I’d forgotten. Sometimes Data, though he doesn’t always think creatively, seems to have an internal tricorder. If he somehow figures out that Robocop can’t survive a whole day without special food, he could just WAIT HIM OUT. Not sure how telescopic he can work, however. Im one of those silent voter. I just think data would lose. Robocop, If I remember Data never technically fought. Plus Data is 100% machine meaning a magnet can make him go haywire, Murphy is 75% machine 25% Human meaning a magnet can’t do much but stick and a little interference. Data is only as fast as a human I don’t remember him having hyper speed or being super powerful. Murphy got reprogramed maybe once but his human self could warn people. Data also has a emotion chip but it’s still just a chip that’s programed, You can’t really reprogram human emotions which reminds Murphy of who he is and why he fights.